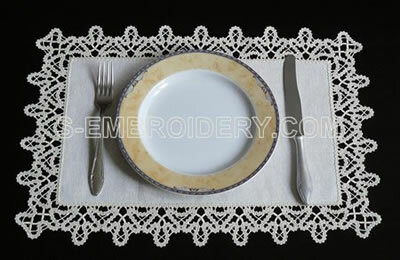 A set of 4 Battenberg lace edging machine embroidery designs. The set includes 3 edging lace designs (single, double and triple) and a lace corner and allows a lot of flexibility in use. 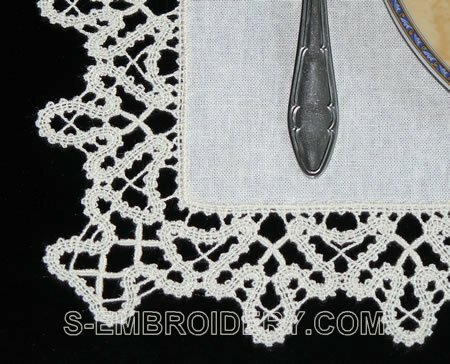 You can use the set to create a place mat (like the one shown below), a doily, topper or table cloth with Battenberg lace edge or you can use it to decorate your curtains. The 4 machine embroidery files come with PDF files with instructions for creating the place mat.